Shawnee’s Sunflower items are rather difficult to find! I purchased these items together and I’m selling them together -- they have apparently been together a long time. The shakers are the larger size at 5 ¼” tall. They have slight discoloration at the shaker holes – not unusual on stove-top shakers – and the cork stoppers have fallen inside. Marked USA. This McCoy pink and blue listing is a shaker set -- these are the stove-top shakers (have little handles) and are in very good condition! The pepper has craze marks – they are not breaks, just crazing, which is not unusual with clear over-glaze items. It also has a production flaw in the handle (looks like a break that was fired closed) and there is a flaw in the pink stripe. Nice set, nicely priced to reflect the minor imperfections. Neat shaker set made by Color Craft of Indianapolis, Indiana! Shakers measure 3” tall. 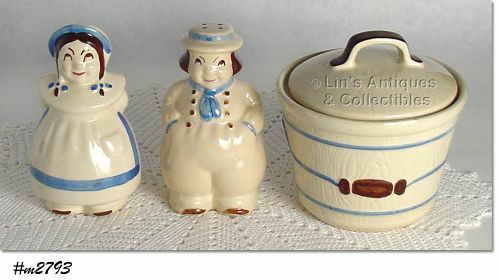 This listing has the larger size Aunt Jemima (Mammy) and Uncle Mose shaker set! They measure 5 1/8” tall and both have in-mold “F & F Tool and Die Co, Dayton, Ohio, Made in USA”. She is marked Aunt Jemima and he is marked Uncle Mose. They are in very good condition with some color loss and both are missing their plastic stoppers. Neat collectibles! Excellent condition Enesco Prayer Lady salt and pepper set! These have the pink “dress”, the original stoppers, and gold and red Enesco foil sticker/label. Super! These little Shawnee shakers are so cute! Even though each shaker has two holes, they’re obviously a set – the ducks are a “couple”. She “holds” a flower and he “wears” a bow tie. He measures 2 ½” tall (at tallest) and she is 2 ¼” tall (at tallest). They are in excellent condition but have lost their original stoppers (I have replaced with new). 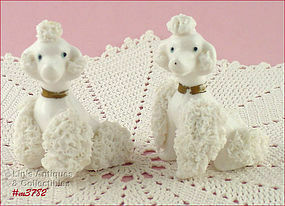 Super nice Lefton spaghetti poodles! 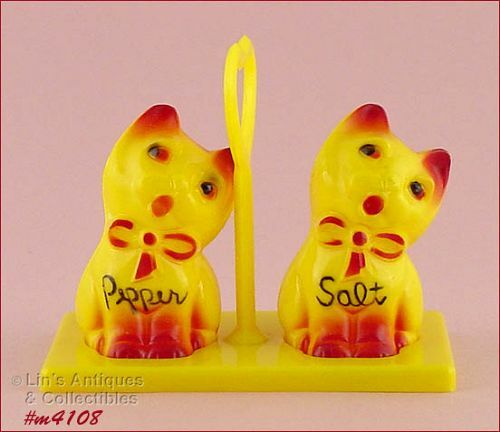 These are salt and pepper shakers and measure 3 ¾” tall. The only “use” evidence is some gold color loss to the paint on their “collars”. The original stoppers were missing so I have replaced them with new ones. Spaghetti poodle shakers are not your everyday find – these are great! 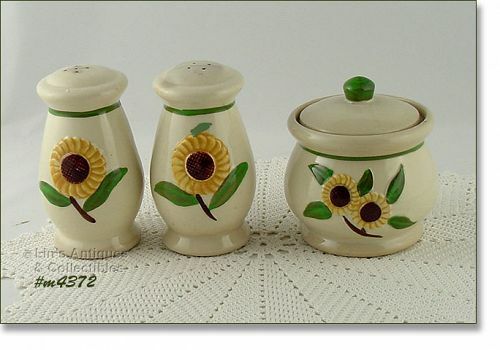 Very nice Shawnee salt and pepper shakers -- these are the range size shakers (5 ¼” tall) and are from the Sunflower line of the late 1940’s! 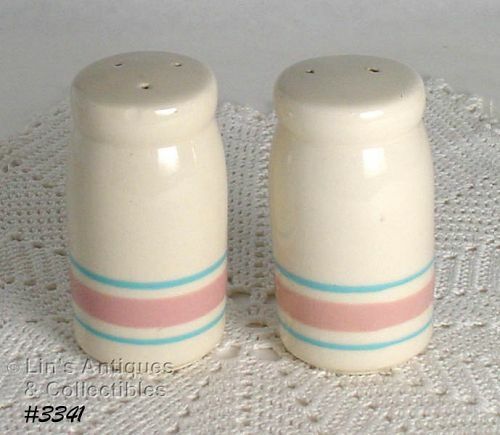 Shakers are marked USA and are in very good condition – the pepper has some discoloration at the top (not unusual) and there is some discoloration at the base edge on both shakers (again, not unusual when kept near a heat source). 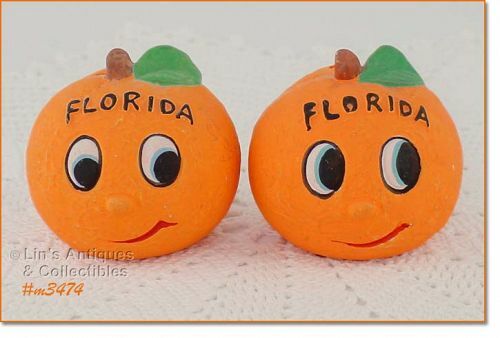 These anthropomorphic shakers are so cute! Shaped like oranges and in wonderful condition with no chips or cracks (have lost their stoppers). One still retains the original blue and white oval shaped “Made in Japan” sticker/label. Neat collectibles! 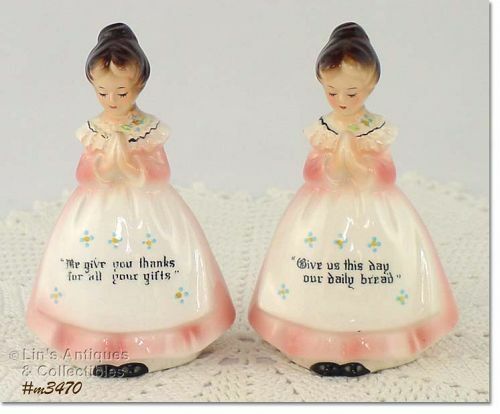 Very pretty Enesco Prayer Lady shaker set in this listing! 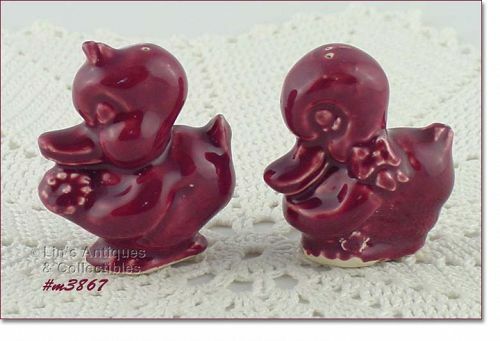 These have dark brown hair, “wear” pink dresses, have their original stoppers and Enesco labels/stickers. Shakers are in wonderful condition with only “use” evidence being slight color wear on the wording on the salt shaker – that’s it! This listing has a really cute Kreiss shaker set – they're mischievous angels! Shakers measure 4 ¼” tall and bottoms are stamped Kreiss. They do not have stoppers, however, I have an assortment of new food grade stoppers and if I have some that fit, they will be included at no charge. I purchased these shakers at an Indiana estate sale. Each shaker has 2 shaker holes. This is a cute shaker set – two Santas! Shakers do not have HH labels/stickers but I believe they are Holt Howard productions. One Santa “holds” a present while the other has a candy cane, both measure 4” tall. Set is in very good condition – there is a teeny ding on a package corner and the other Santa has a teeny ding on a mustache tip. Neat set, priced to reflect minor imperfections! 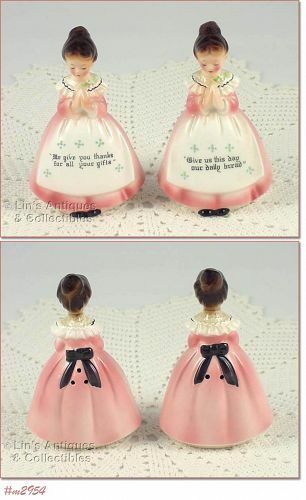 Very pretty Enesco Prayer Lady shaker set! These have the pink “dress” and dark brown hair. Both have the original stoppers and they’re in super condition. One has a teeny production ding above an eyebrow – has color and glaze. The only “use” evidence is a teeny (1/16”) ding at bottom of apron hem on salt – that’s it! This is a wonderful find – a range set made by Shawnee for Great Northern! Set consists of Dutch boy and girl shaker set (5”) and a “water bucket” grease jar (or sugar bowl). Extra nice shaker set from McCoy’s Stonecraft line! These are the pretty creamy color with pink and blue bands/stripes. Measure 3 5/8” tall and are in super condition – no chips, no cracks – have minor crazing and have lost their stoppers – that’s it! I purchased a number of food grade rubber stoppers and if I have a size that fits, I will include at no charge.